Ballpark Basics: A beautiful new stadium for a popular team. 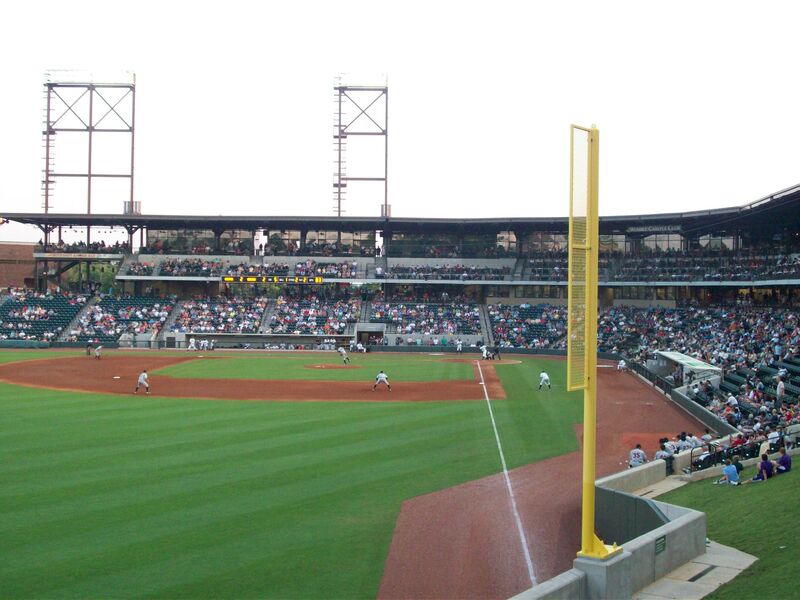 Ballpark Breakdown: Originally intended to open in 2009, funding issues and construction delays caused the 25.7 million dollar BB&T Ballpark to open one season late, in 2010. 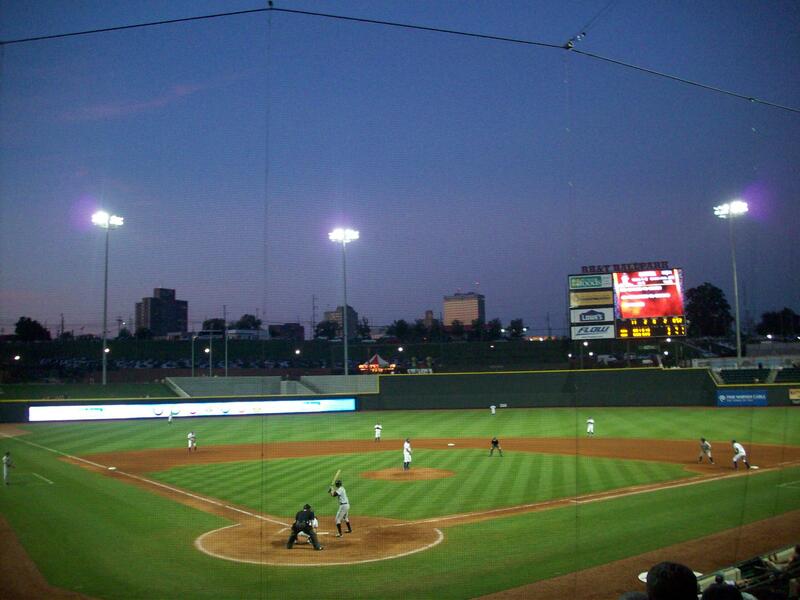 With the new park, the team underwent a name change from the Warthogs to the Dash – a name that references the hyphen or “dash” between town’s names: Winston and Salem. This park is in the southwest corner of downtown, which the city hopes will anchor a redevelopment project that is intended to revitalize the area. While there is a ways to go, the new development in the area shows that the plan is starting to take hold. 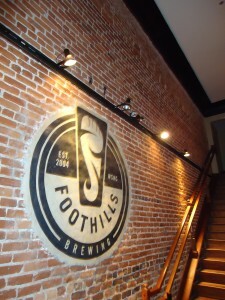 The field is walkable from certain parts of the city – including Foothills Brewing Company, the brewery paired below. If you do drive, there are plenty of parking options, including a number of parking decks within easy walking distance. The closest ones charge $5 for parking but there is one just about three blocks away that has free parking; the walk from the free garage is not bad at all and takes you by new condos and retail shopping. For those with parking passes, there is also parking lot directly behind the field, which also happens to be one of the only things they got wrong designing this park. The lot itself is fine, but if it wasn’t there patrons of the park would have a gorgeous view of the Winston-Salem skyline. 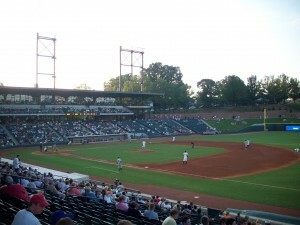 However, the parking lot is located on a hill so the view behind the outfield wall is dominated by parked cars instead. Arriving at the park, you actually enter through the gates in the outfield since BB&T fronts the business loop of interstate I-40, which is really quite a shame as the facade of the stadium is all brick and quite striking. Like many of the newer parks, the concourse is wide open and you can walk entirely around the field and still watch the game as you explore the ballpark or get your concessions. 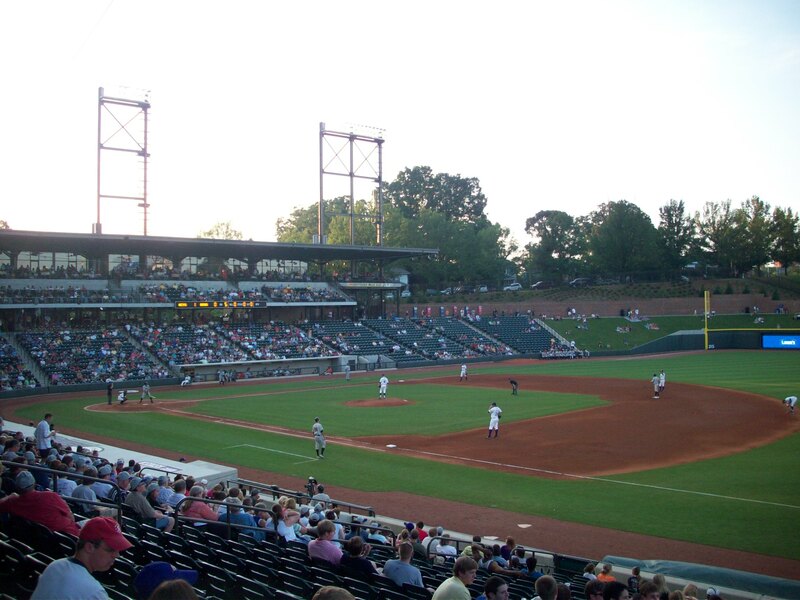 One of the most unique aspects of BB&T is the home run porch with a few rows of seats jutting out of the right field wall. Not only does this give you a unique view of the field but it adds an interesting dimension to the outfield wall. There is also a grass berm in left field, providing a very relaxed way to take in a game as people have picnics and kids run around, weaving their way through the chairs and blankets. Also for the kids, there is a huge play area behind the scoreboard in center field with a large carousel and inflatable activities. The picnic table area in right field is yet another seating option. It is vast and angles up the further you get away from the field so that even the tables in the back afford an excellent view. The second level includes 16 suites, two party areas at each end and additional seating. 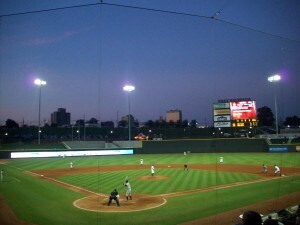 A long LCD board along the shallow left field wall shows ads and upcoming events at the stadium. Since the board changes they can show lots of different ads here, so the outfield walls are not covered with banners and advertising. Natty Greene’s, one of our favorite Carolina craft breweries is one of the field’s major sponsors, and they serve their beer throughout the stadium – which gives you the most bang for your buck if you take in a game on a Thirsty Thursday. 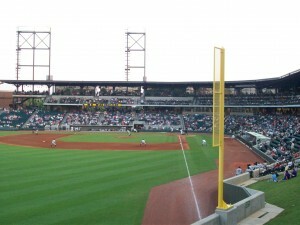 The owners have more plans for the park that include the opening of a tiki bar behind left center field, and similar to the fields in Durham, NC and Charleston, WV, will incorporate an office building into the left field corner whose lobby will contain the team store, replacing the makeshift shop they have in the meantime. The city has embraced the new stadium, and the reincarnation of their team to the point that there were scalpers outside looking for extra tickets to sell, which isn’t something I have ever witnessed for a Single A ballgame before. Brew Basics: Sometimes it’s the second impression that counts. We were really excited to try this one – there is quite a lot of buzz about Foothills, and they’ve integrated themselves into several different sporting facilities including extensive set ups at the Carolina Hurricanes HBC Arena and The Durham Bulls Athletic Park. Their Sexual Chocolate release party is all over Facebook and judging by RSVP’s, obviously more than just a local event. We’ve visited twice. Our first visit, we found the locals and the servers to be nice. Unfortunately the outgoing, friendly vibe did not extend to the bartenders. They seemed to be having some kind of problem with one of the kegs when we first arrived, so we chalked up the slow service to that at first; but we were completely ignored several times, and then when someone finally stopped by, there was no welcome or acknowledgement, it was just “do you know what you want?” and she was then annoyed by our answer (it was no) because a list of the beers was not posted anywhere in the bar, and we had yet to be offered a menu. the service continued to be spotty and curt – as we were tossed back and forth between one bartender who kept disappearing for long stretches, and our initial server, who while consistently occupied was having a slow enough night to give us better service than we got, and who even upcharged us for some bbq sauce which we were substituting for mayo on a sandwich. However, food we ordered came out quickly and was good, the atmosphere of the place was a lot of fun, and most importantly the beers themselves were very good (more info on this in the next section). So we decided a second visit was in order. From our first visit in the winter, we knew that the popularity of Foothills creates for a very crowded bar area (even pulling our stools together till they were touching, I still kept getting bumped by the man next to me). So this visit on a warm summer night, we requested a table outside. While we were waiting for a spot to open up, we bypassed a large dining room about 60% full of patrons and headed to the bar area. Made up of a combination of exposed brick and light and dark woods, the bar is large, with an open view of the casks to the far end. Bar tops fill three quarters of the back room, and the bar lines the left side of the room. The area is decently sized, and they’ve done a lot to maximize the seating options. They do have live music on occasion, but the bands perform in the main dining area which is the larger of the two rooms. Outside seating is fairly limited, but if you can grab one of these spots on a nice day, do. Foothills in right in a nice downtown area with lots of good people watching. This time around we were able to get a beer right away, and didn’t have to wait long for a table. Our server was friendly, knowledgeable and helpful – as was the bartender who served us before we went outside. Both knew a lot about upcoming events at Foothills, and suggested we come back for a seasonal release party the following weekend. These parties are hugely popular, and we would love to be in town for one in the near future. This visit to Foothills won us over, and we were happy to have been able to give them another chance – we will definitely be back! The Foothills mug club is actually more of a traditional loyalty program, where you earn points for each dollar you spend. 175 points gets you $10.00 (which, nicely enough is exactly how many points they give you on your birthday). The money can be spent on beer, food or merch, as you so choose. They’ve also got “Beer School” which costs $15 bucks and is the traditional brew works tour and samples with some “how beer is made” factoids thrown in. Growlers are apparently also available, but there were no signs indicating purchase or refill price, just as there were no signs advertising what they had on tap. There are just about half a dozen beers as everyday offerings, and they have up to two seasonals rotating through about every other month. They’ve also recently acquired the Carolina Blonde and Cottonwood Ales brands, so expect to see more options if you haven’t visited in a while. They charge $8.99 for a 6 beer flight, to which seasonals can be added for an additional charge. Not planning a visit to Foothills anytime soon? Never fear, their beers are on tap in a variety of restaurants around the area, and in twenty other cities throughout Carolina. Salem Gold (3.75% ABV, 35 IBU) – The lightest beer that Foothills makes. The Salem is one that can be found at the ballpark. It laces the glass and has a light, crisp flavor with a strong aftertaste and high carbonation that effervesces in your mouth. Pilot Mountain Pale Ale (4.75% ABV, 43 IBU) – This is an American style pale ale, made with a variety of different hops that lend to a solidly hoppy aroma. It’s another highly carbonated beer that has more upfront flavor than the Salem Gold, but is watery with a slightly bitter mouth feel. A fairly consistent beer with no “fa-bam”. Torch Pilsner (5.3% ABV, 35 IBU) – very light in color, in fact even lighter than the Salem. The Torch has a subtle aroma, mostly of wheat with maybe a hint of florals. It was almost medium bodied but there was very little to this beer, and neither one of us were very impressed. Hoppyum IPA (6.3% ABV, 70 IBU) – Drinking our way through the flight, this was one of the first we came to that we really liked (and not that we were snooping…but seemed to be the most often ordered brew as well). Iced tea color, citrus aroma, bitter hops that give this an all-around sweet but solid palate. The Hoppyum is dry hopped which imparts a slightly earthy taste and rounds out with a clean finish. Seeing Double IPA (9.5% ABV, 126 IBU) – Our absolute favorite of the evening, the Double is a hazy, high gravity beer with full body and a pretty rust like color. It’s got a hint of citrus and cinnamon that provided great flavor and aroma, which even with a very high IBU rating, helps takes away much of the typical bitterness of an IPA. People’s Porter (5.8% ABV, 42 IBU) – think and dark, but not filling, and so somewhat reminiscent of a Guinness. The taste and smell are mainly chocolatey with hints of wood and coffee. The porter isn’t bad, and tastes bitter and a little sweet with an excellent reddish brown color but overall it is kind of thin, and leaves you wishing the flavors in the aroma came through more in the palate. Total Eclipse Stout (7% ABV, 48 IBU) – The winter seasonal and their barrel aged offering. This is much more coffee than chocolate in both taste and aroma. The Total Eclipse is a thick blackish beer that coats your tongue and laces the glass, molasses-ey mouth feel that is rich with slightly smoky bite.